Click here to listen to, and read the words of, the abhanga. The devotional songs by the seventeenth-century saint Tukārām Mahārāj continue to evoke love for God in seekers’ hearts as they did when they were first composed. This poetry expresses Tukārām’s own state of immersion in divine bliss and his direct knowledge of the Truth he venerated. Tukārām lived in the village of Dehu in Mahārāṣṭra, which is the same state of India in which the Siddha Yoga Ashram Gurudev Siddha Peeth is located. He wrote thousands of abhaṅgas in the vernacular of the region, the Marathi language, so that everyone—renunciants and householders alike—could learn and understand them. In Tukārām’s time, most of the villagers and farmers living in this area could not read, and only Brahmins, the priestly caste, were allowed to study Sanskrit, which was the language of the scriptures. With his songs, Tukārām was putting the highest teachings into the hands—and into the hearts and minds and voices—of the people. The abhaṅga we’re looking at here is Oṁkāra Pradhāna, “The Source of Oṁ,” in which Tukārām teaches about the nature of Reality, that which is beyond form, by describing its relationship with a form that would be familiar to anyone of his day. The refrain of Oṁkāra Pradhāna declares that the origin and source, the pradhāna, of the primordial sound Oṁ is the widely worshipped Lord Gaṇeśa. According to the philosophy of Vedānta, Oṁ is the first expression of supreme Consciousness. By saying that Lord Gaṇeśa is the source of Oṁ, Tukārām suggests that Lord Gaṇeśa is supreme Consciousness. In other words, the saint is giving us the form of Gaṇeśa as a means to invoke, honor, and worship the Formless. This particular deity and, likewise, all deities are forms of the one Consciousness that pervades creation. In this abhaṅga, Tukārām is taking us from the visual appearance of this beloved deity—always depicted with the body of a boy and head of an elephant—to that which is beyond time and space, the eternal primordial sound. Lord Gaṇeśa, Tukārām tells us, is oṁkāra, the sacred syllable that resounds as Oṁ. In this way, Tukārām sees Lord Gaṇeśa as the origin of what he calls “the three gods.” These deities represent the powers by which supreme Consciousness manifests, sustains, and withdraws the universe. Tukārām associates these functions with each of the three sounds that constitute Oṁ: A, U, M.
Brahmā, the Creator, also called Akṣara, “imperishable,” is represented by A, the first letter of the Sanskrit alphabet, which reminds us that Brahmā is the first being to arise from the Supreme. Viṣṇu, the Sustainer, is represented by U. This vowel corresponds phonetically to the Sanskrit semiconsonant V, which is here associated with Viṣṇu. We can see from this why Tukārām calls Gaṇeśa “the Mother and Father” of everything that exists. Tukārām makes it clear to his listeners that the teachings he expresses in this song are not just his own ideas. They come, he says, from the Vedas and the Purāṇas—recognized scriptural sources. Oṁ—this whole world is that syllable! Here is a further explanation of it. This Upaniṣad expresses an essential teaching of the Siddha Yoga path, which envisions the entire universe arising from the primordial sound, being sustained by that sound, and merging back into its originating source. From vast galaxies to the Earth, from the majestic mountains to the tiniest flowers, from sea creatures to human beings—each of the diverse forms in creation is essentially one with the formless Truth. In this abhaṅga, with its succinct teachings, Tukārām invites us to understand the nature of the highest Lord by invoking and worshiping the form of Lord Gaṇeśa. This is something we can do by singing the abhaṅga and by reflecting on its teachings. Devotional songs like this one bring forth our love for God, showing us how knowledge and devotion go hand in hand. Studying, singing, or simply listening to such abhaṅgas can awaken in our heart the awareness that the Truth we are honoring lives within us in the form of our very own Self. 1 John A. Grimes, Gaṇapati: Song of the Self (Albany, NY: SUNY Press, 1995), pp. 77–78. 2 Grimes, Gaṇapati, pp. 45-46. 3 The symbolic interpretation of AUM was provided through personal correspondence with Dr. Borayin Larios, University of Heidelberg, Germany, August 2018. 4 Grimes, Gaṇapati, pp. 41-42; and Larios correspondence. 5 Māṇḍūkya Upaniṣad, 1-2; Patrick Olivelle, Upaniṣads, (Oxford, UK: Oxford University Press, 1996), p. 289. Swami Shantananda began following the Siddha Yoga path in 1972. In 1977, he took monastic vows to become a Siddha Yoga Swami. Swami ji serves Gurumayi as a Siddha Yoga meditation teacher, teaching in Siddha Yoga workshops, courses, satsangs, Sadhana Retreats, and Shaktipat Intensives. 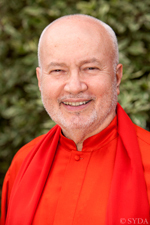 He also serves as a member of the Siddha Yoga Teachings Council, which plans how the Siddha Yoga teachings will be presented on the Siddha Yoga path website and in global teaching learning events. Swami Shantananda is the author of the book The Splendor of Recognition, an illuminating commentary on the Pratyabhijña-hrdayam, a key text of the philosophy of Kashmir Shaivism. Swami ji has also authored many of the letters and expositions featured on the Siddha Yoga path website. He has an extensive knowledge of the Indian scriptures, and his writing elucidates the teachings of these scriptures in a way that is accessible to contemporary seekers. After reading this beautiful commentary, I felt as if I had just heard a lecture at "the University of the Self." I felt inspired to be conscious of listening to and repeating the sound of Om, and in doing so, to also be conscious of keeping the company of Lord Ganesh. I feel grateful for the way this commentary explains the history and philosophy behind Tukaram's abhanga in such an accessible and meaningful way. I’m so grateful for Swami Shantananda’s enlightening commentary on Tukaram Maharaj’s beautiful abhanga. Throughout the years, Lord Ganesh has been a resting place for my mind. His adorable form makes it easy for me to connect with his protective and loving energy. Now I see that Lord Ganesh's divine quality of embodying the primordial sound AUM must be the reason I feel calm and grounded in his presence. This new understanding makes me love my Shri Ganesh even more. Thank you, beloved Gurumayi, for gracing us with this jewel from Tukaram Maharaj. In much the same way that Tukaram made the highest teachings accessible to everyone by writing in the vernacular of Maharashtra, Swami Shantananda’s commentary on Tukaram’s abhanga helped me not only to understand, but to experience its truth. As I read Swami ji’s commentary, the compact bud of Tukaram’s abhanga blossomed into a beautiful flower within me. The stresses of my day dissolved as my awareness expanded beyond my own body into a brief, delightful experience of oneness with the universe. After reading this profound commentary on Tukaram Maharaj’s ever-lasting words, I offer my prayers to Lord Ganesh—whose very form is the source of Om—with newfound understanding on this auspicious day. I understand more deeply now why celebrating Lord Ganesh was always magical as I was growing up. All the preparation that went into each celebration—including the amazingly delicious modak (Ganesh’s favorite sweets) that we offered to him—inspired us to anticipate Ganesh’s arrival and to expect that he would reside with us for the duration of the celebration. Thank you for this commentary and the sweet nostalgia it brought to me.